Accessibility – Going to a physical space such as a gallery to view art can be both time-consuming and limiting. Depending on your location, it may even be impossible to get to a dealer who stocks the type of artwork you’re interested in. Online auctions give you the ability to view and bid on artworks that may be located in another county, state, or time zone, rather than being confined to only what can be found in your area. Transparency – Galleries have been known to restrict the number of works available from artists and to hide information about the value of those works, making it difficult for art collectors to accurately assess the market. Browsing online auctions gives you the chance to compare and research, ultimately allowing you to make better-informed decisions. Variety – When art dealers have to maintain physical space to display the artworks they have for sale, they have to make choices about what they’ll offer. Some will concentrate on particular artists, styles, or time periods, which leads to a narrower selection. Online auctions don’t have that constraint, and thus can offer a wider range of pieces to choose from. Excitement! – When you buy at auction, the process itself is part of the appeal, from determining the items you’ll pursue, deciding on your bidding strategy, and monitoring the action. The thrill is heightened in a live auction, where you are bidding in real time against other collectors, all intent on winning the same item. When you do win, you not only have an artwork to treasure, but you’ll also have a story to tell. Savings – While the media likes to talk up stories of famous artworks fetching jaw-dropping prices at auction, the reality is that most of the time, buying fine art at auction can save you money. Depending on why or by whom the art is being sold, it may be offered with no reserve price (the minimum amount a seller will accept) because the seller is eager to get whatever price they can. 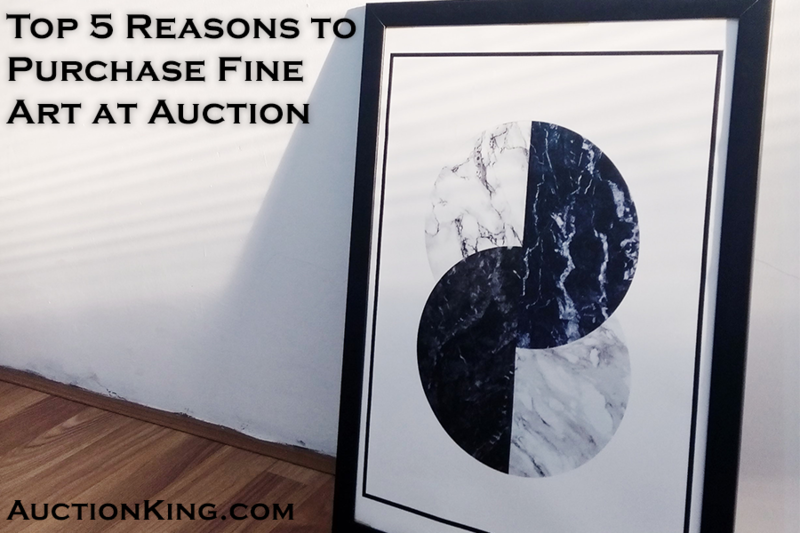 In addition, online auctions do not have to support the expense of maintaining a gallery space or similar physical location, which can drive up the fees that a dealer adds to the cost of every artwork they sell. An auction can be a great opportunity to get a stunning piece of art at far less than you would have imagined. Auction King stocks an array of authenticated originals, prints, lithographs, etchings, and more. We’re constantly on the lookout for new high-quality pieces for our customers. Our secure proprietary bidding platform gives you the convenience of online bidding with confidentiality and confidence. Register for a free online account today to get started. Larimar: Found only in the Dominican Republic, this variety of the silicate mineral pectolite can be white, light blue, blue-green, or deep blue. It was originally discovered in 1916 by a priest, but not mined at that time. The stone was rediscovered by a Dominican and a Peace Corps volunteer in 1974. Tanzanite: Discovered in 1967 in the Mererani foothills of Tanzania, this variety of the mineral zoisite exhibits strong trichroism (meaning that it can appear either blue, violet, or burgundy, depending on how the crystal is oriented). The only area in which this gemstone can be found is a mere 4.3 by 1.2 miles. Black opal: While white opals are fairly common, black opals, which have a black background color, are extremely rare. The vivid play-of-color that characterizes the most valuable opals stands out particularly well against a dark background, making these stones highly coveted. Grandidierite: This mineral was first discovered in Madagascar in 1902, and named in honor of Alfred Grandidier, a French explorer. Grandidierite is a blue-green type of magnesium aluminum borosilicate that gets its color from trace amounts of iron. The few gem-quality examples of this mineral ever found have all come from Madagascar. Alexandrite: First discovered in the Ural Mountains of Russia, this color-change variety of chrysoberyl was named in honor of Alexander II, the heir to the Russian throne. The gem can appear red or green, depending on the light source under which it is viewed. Although new deposits have been discovered since the original source was mined out, this gem is no less rare. Benitoite: This gem is named for the San Benito River in California, near where it was first found in 1907. While the rare barium titanium silicate mineral has been found in other places, the only gem-quality examples come from a sole source in California, which closed down in 2005, making this gem even more difficult to find. Painite: Found only in Myanmar, painite was identified as a new type of gemstone in 1957 from a single crystal specimen. Although more painite has been discovered over the last decade, much of it cannot be made into faceted gems due to heavy inclusions and fractures. Red beryl: This extremely rare type of beryl gets its unusual color from trace amounts of manganese. It is found in gem-quality crystals in only one location in the world, the Wah Wah Mountains of Utah. Taaffeite: Taaffeite is the only mineral known to have been first identified as a new type of gemstone from a cut and polished stone. The mauve stone had been misidentified as a spinel, but its discoverer, Richard Taaffe, noted qualities that distinguished it from that gemstone. It was eventually traced back to its source in Sri Lanka, but remains exceedingly rare. Jeremejevite: Although this light purplish-blue mineral was first described in 1883, the first crystals found in Russia were tiny and not suitable for cutting. Sources in Namibia have since yielded jeremejevites that are large enough and of suitable quality for gemstones, but in quantities so small that it is still considered one of the rarest of all gemstones. 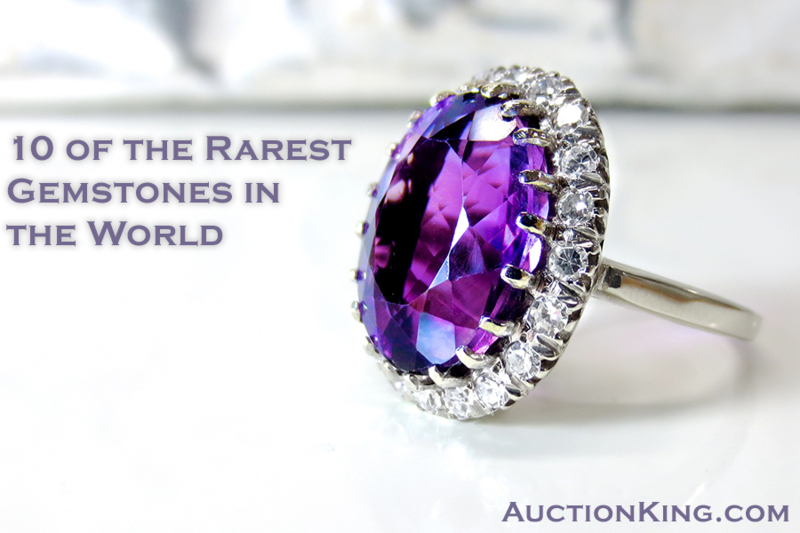 Whether you’re looking for unusual gems or a familiar favorite, Auction King has a wide selection of fine jewelry at below market prices. Our secure auction site allows you to bid in confidence from the comfort of your own home. Register today for a free online account and start bidding. Decide what you want: Luxury watches come in a wide variety of brands and general aesthetics. Choosing the type you prefer is the first step to guiding your decision on what to bid on. There is no right or wrong here, so don’t feel like you have to choose a particular watch just because it is popular with other collectors. While a luxury watch can be an investment, you shouldn’t only buy with potential resale value in mind. Watches can take a while to appreciate in value, so above all you should purchase something that you will enjoy owning. Research: Once you’ve identified the brand and model of watch you’re interested in, do some homework. Get a general sense of what price you could expect to pay, and how the condition of the watch could affect it. This will help you spot good deals—or rule out overpriced items—and set your budget. Buy from a trusted source: High-value collectibles will always attract counterfeiters looking to make a quick buck off of trusting buyers. Make sure that the auction site you’re dealing with offers both verification of the authenticity of the watches they have for auction and secure bidding and payment methods. If the site seems defensive or not forthcoming about whether the watches they have on offer are genuine, that’s a red flag that they’re probably not. 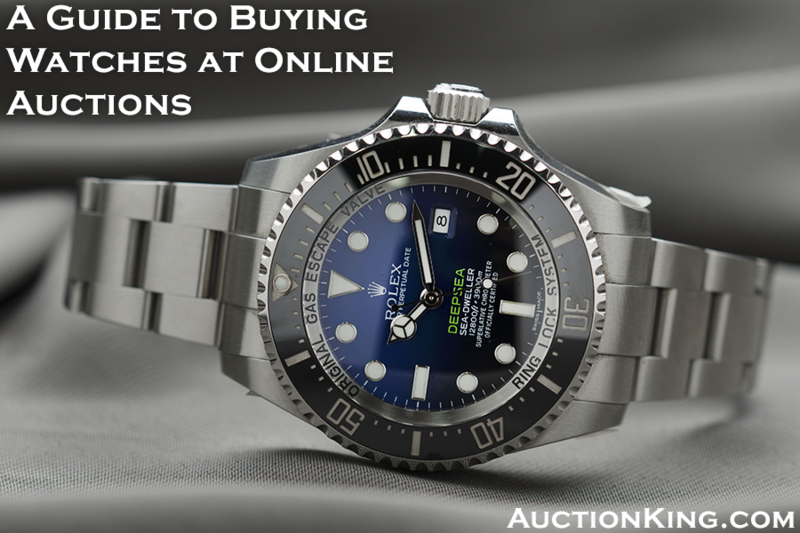 When you take your time to consider your purchase carefully, buying a watch at an online auction can be a rewarding experience. At Auction King, we offer a wide and varying selection of luxury watches from iconic brands such as Rolex, Cartier, Bvlgari, and more, with bids starting as low as $1. Our proprietary bidding platform allows you to bid securely and privately from the comfort of your own home. Register today for a free online account to start bidding and start winning! What’s the quality of the signature? : The signature should be clear, not smudged or spotted. Where is the signature placed? : In general, collectors prefer that a baseball be signed on the “sweet spot,” the location on the ball where the seams are closest together. This is because a signature in this spot makes for a more appealing visual when the ball is on display. Is it inscribed? : If the signed ball includes an inscription such as a team slogan, a personal motto, or an acknowledgment of a team or personal accomplishment, in general its value will be higher than a similar ball with just a signature. Is it personalized? : While a ball inscribed to a particular recipient by name will have great sentimental value for the person who received it, it will bring less on the sports memorabilia market than a ball that is not personalized. Does it comes with a certificate of authenticity? : As with any type of collectible, the signed baseball market attracts unscrupulous dealers. They may try to exaggerate the value of goods they have on offer or pass something fake off as being the real thing. Reputable dealers will supply a certificate of authenticity with a signed baseball so you can be confident that it has not been misrepresented. 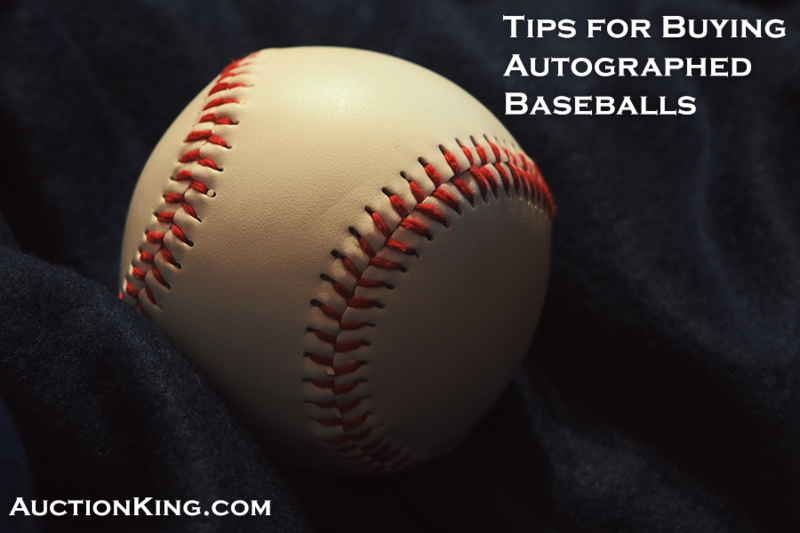 Signed baseballs follow the general rules that apply to the value of sports memorabilia—value increases with rarity, the stature and popularity of the player who signed it, and whether or not that player is still living. When you’re contemplating purchasing a signed ball, take the time to do a bit of research to figure out the general price you can expect to pay. If you think you might sell it down the road, know that prices for memorabilia can vary depending on current fads, so be prepared to hold onto the ball for a while until you can get the price you want. In the meantime, store the ball in a climate-controlled environment protected from UV rays, which can fade the signature and lower the ball’s value. Auction King gives sports fans the opportunity to bid on authenticated memorabilia at below-market prices from the comfort of their own homes. We bring you collectible treasures from baseball, football, basketball, soccer, and more. Register today for a free online account and start bidding. While golf doesn’t have as showy a following as other major sports, the legions of devoted golf fans and players testify to the enduring popularity of the sport. Golf as we know it was first developed in southeastern Scotland in the 15th century. It was so popular then that King James II banned it in 1457, complaining that it was distracting his archers from their practice. That ban didn’t last long—by 1500 it had been lifted, and shortly thereafter King James IV took up the sport. Golf spread around the globe with the expansion of the British Empire, and over the centuries the rules of the game and the equipment used evolved into the forms we are familiar with today. Golf balls have undergone dramatic changes since players first used bent sticks to whack a ball toward a designated target in the fewest number of strokes. The very oldest golf balls look nothing like the golf balls you would purchase today. While there is speculation that very early golfers used either wooden balls or leather balls stuffed with hair, the earliest balls that we know for certain were used for golf were made of leather stuffed with feathers, developed in the 17th century. These were labor-intensive to make and thus expensive—a ball maker could make only two or three of these balls per day. In reasonable condition, these early leather golf balls will go for thousands of dollars. The first molded ball was introduced in the mid-1800s. These were made from gutta percha, a light rubbery substance made from the sap of the sapodilla tree, found in Malaysia. These were the first golf balls that could be mass produced. Although the first gutta-percha golf balls produced were smooth, players found that the nicks they gained through play helped produce a more stable flight path. Manufacturers began adding raised patterns to these balls to improve performance. The price for one of these on the collectible market will vary depending on the rarity of the ball and its condition, but you can expect to pay a few hundred dollars. The Haskell ball—a golf ball with a solid core wrapped in rubber threads and covered with a layer of gutta-percha—was invented at the very end of the 19th century. 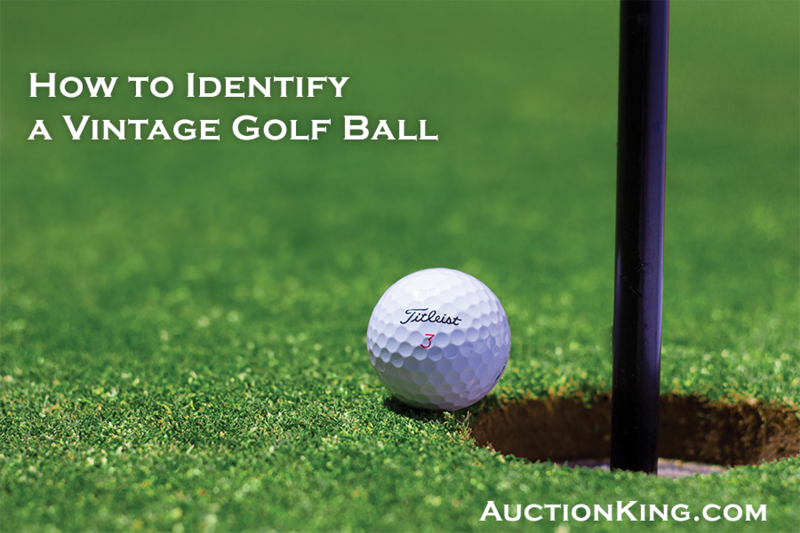 This most closely resembles the golf balls that are used today and is the most common type of golf ball you’re likely to find on the vintage market. However, the pattern of dimples that distinguish modern golf balls was not introduced until the 1930s. Before then, golf balls had raised patterns that varied by manufacturer. Rare and unusual patterns can boost the price of a golf ball from this period. Another popular category of collectible vintage golf balls is the wrapped golf ball. From about 1910 to 1970, manufacturers sold golf balls individually wrapped in coverings advertising their maker. Balls still in their wrappers can sell for several hundred dollars, particularly if they are very rare or in mint condition. For golf aficionados looking to connect with the history of the game, collecting vintage golf balls is one way to satisfy that urge. Auction King offers authenticated sports memorabilia and collectibles at below-market prices in a secure, convenient format that allows fans to own a piece of their favorite game. Register today for a free online account and start bidding!